Since our twins first went to school, we were inundated by well-meaning advice from many different sources about whether to split them up or keep them together in the same class. Friends, other parents of twins, family members and even the teachers and school all weighed in on the subject, and unless you have nerves (and convictions) of steel, it is possible for you to doubt yourself at every turn as to whether you are making the best decision for your twins. Starting school is such a big step in any child's life, yet twins potentially have a secret weapon to combat the period of adjustment, loneliness, and fear that every child needs to face on first stepping into a new entrants' classroom. So why the pressure to split them up? I think the answer can be found in the history and stereotypes with which schools and parents have traditionally approached twins in the classroom, especially identical twins. After all, for a teacher, it's just more difficult to have a set of what is essentially the same person in your class, no matter which way you look at it. It is hard to call out a name and never be certain that you have the right one (in fact, mine sometimes answer to each other's names just because they don't want to offend). There's no denying it's complicated. Traditionally, schools have always decided that it is better to split the children up so that "they can develop into individuals, with their own peer groups". That is all very well, but, if your twins are as close as mine are to each other, there is no denying that you are removing them from what is essentially their own primary peer group (i.e. their twin), who is their best friend in all the world, and forcing them to be alone and make new friends without the benefit of the support system that they have had next to them for the whole of their lives. Some twins will rise to the challenge, and go on to develop those relationships with others as would be hoped. However, for some it is not as easy. They develop insecurities and emotional abandonment, and the whole thing is essentially very difficult for them to cope with. Nowadays, schools allow parents to weigh in on whether their children should be left together or split into different classes. We had a big decision to make when ours first started. Being the person that I am, I turned first to the research that had been done on whether to split them or not. What I found was very interesting: there is practically no research done on whether twins thrive better together than apart. However, I did find one article (that probably can't be generalised because of the very little research done on the subject) that stated that separating twins (monozygotic i.e. identical twins only) in the first year of school leads to more internalising problems for those twins, and that these problems tended to persist over time and also increased over time following the first year of the twins' separation Those separated twins also experienced more academic problems than those that were kept together, and had poorer reading abilities. However, dyzygotic twins (non identical) who were separated after the first year of school tended to work harder than those who were kept together. The article also discussed separating twins later, and found that separating identical twins later in their school careers might not be the answer either. The twins separated later also experienced more internalising problems and poorer academic results, and the authors think this is indicative of emotional problems developing in the twins. This does not mean that all twins who are split up in the first years of school will go on to develop emotional issues, but it does show that some twins who do show emotional distress when they are first split up will continue to have emotional problems as they develop. So based on this research, what is the answer? I think it is firstly important to differentiate between identical and non-identical twins when thinking of whether to split them up or not. Identical and non-identical twins seem to respond very differently to the effects of being separated at school. Internalising problems are present for both sets when they are first split up, but the emotional problems are persistent only for the identical twins. This might be because identical twins experience a closer relationship generally than non-identical twins. The result of this is that any decision to split up twins in order to "enhance their individual development" must be taken into consideration against the weighty knowledge of possible negative effects on their emotional adjustment which can potentially be long-reaching. This is definitely not to say that all twins should be kept together in the school setting, but rather that the family and school should collectively come to a decision based on the twins' needs, regardless of school view or pressure. Also this implies that any decision to separate the twins further down the track should be taken with extreme care and consideration, and accompanied by meticulous planning for how this should happen. It is easy to assume that because they are older, they will take separation better, but this is not supported by the research. 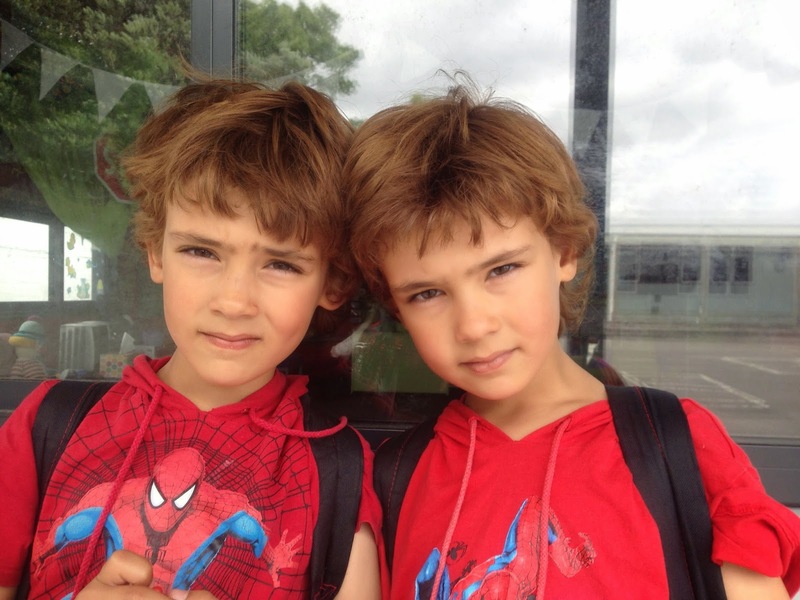 Schools should keep an eye on newly-split twins to see if there are any signs of emotional disturbance and intervene where necessary. Separation is never a permanent state - if the twins don't appear to be coping, they can always be reunited later on. It provides a framework for guiding any discussions that you might have with the teachers and school and also help you to stand against any pressure you might feel to separate your multiples against your will! However, that doesn't stop the endless comments from others, and especially teachers, that it might be better to split them up. We have noticed that anything amiss in the classroom can be laid at the door of there being a twin in the class too. The one is shy and talks softer at group time? It's because of the twin. The one taking slightly longer to learn to do their letters properly? It's the twin. And so on. I think a teacher has approached us on average about once every six weeks asking whether it would not be better to split them up, and with no better reason given than the above. When I ask, "Are they disruptive in class together?" the answer is always no, in fact the opposite: they encourage each other to perform better. Like I said, it takes convictions of steel to stand against the pressure. But take heart, if your decision has been well-considered and thought through, and also discussed in conjunction with the school, you can feel confident no matter whether your decision is to keep them together or separate them. **Please remember, the decision we made to keep our twins together was the one we made after careful consideration of many factors like independence, social skills, experience of being apart, language abilities, interests, friends, age and so on. What worked for our twins will almost certainly not be the same for yours! The article I mentioned is "What effect does classroom separation have on twins' behaviour, progress at school and reading abilities" by L.A. Tully, T.E. Moffitt, A. Caspi, A. Taylor, H. Kiernan, and P. Andreou in Twin Research, Vol 7 Number 2, pp. 115-124. As the parent of now adult identical twins I heartily support your position. Two rules of thumb that usually worked for me: 1) Always ask them what they want - it is their lives after all. 2) Don't do drastic and potentially painful things because some authority or "the research" says it's "good for them" - be minimalist and humane.